Lou reed for Supreme NY graffitti poster. It's strange to be working on the Warhol exhibit in Mons just now. You'll hear enough 'Walk on the wild side' and 'Perfect Day' puns everywhere else, so here are some lesser known gems from the man. Lou reed & Antony - 'Candy Says' live. Lou Reed discovered Antony and toured with him for a long time before Antony & The Johnsons broke. I love the way Lou looks at Antony at the end of this song. He's so moved by what just happened on that stage. 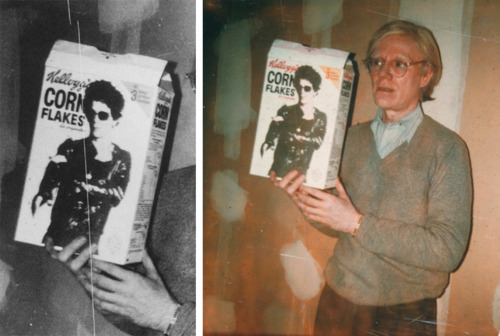 Andy Warhol with Lou Reed Cornflakes Box. About five years before The Velvet Underground, he was still Lewis Reed and he made songs like this one. Lou Reed & The Velvet Underground - Venus in Furs. The eighties were hard on some of the greats, and truth be told: Lou Reed put out some awful stuff. Here he is rapping in the video for 'The original Wrapper'. Lou Reed has no patience with the press machine. Here he is during the peroxide era in Sydney. He didn't mellow when he got older, either. Here's Lou Reed traumatizing a Swedish interviewer for 'Centrum', a 'program bout culture' from Stockholm. But this is all just trivia. The songs will remain. Lou Reed & John Cale playing 'Berlin' live at the Bataclan in Paris, 1972. Nico is watching from the back. This is how I'll remember you today. So long, Lou.